Just yesterday we told you about a useful tweak called SwipeSiri, which you could dismiss Siri with just a swipe. There’s another tweak called LockAssistant that places a Siri icon on the Lockscreen. Now here’s a new one that is going to help both of these tweaks and also let you use Siri without ever having to use the Home button. SiriBoard, like the name suggests, is a new Cydia tweak that adds a Siri icon to your homescreen enabling you to launch it from the SpringBoard. A nice Siri icon will be placed on your homescreen, which will eradicate the need to use the Home button. In the long run, it will help reduce the ‘wear and tear’ of the button and increase its life. There are no settings added and it works perfectly fine with LockAssistant and SwipeSiri. Now you can access Siri from the Lockscreen, the homescreen and also dismiss it without using the Home button. 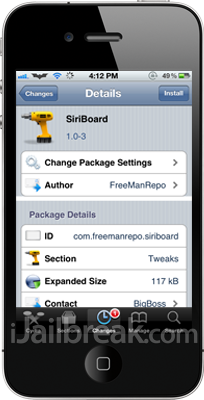 You can download SiriBoard for free from the BigBoss repo in Cydia. Try it out and tell us what you think of this tweak.